I'm hosting Thanksgiving this year, so I've been cleaning and doing projects around the house. Worn out, I fell asleep, and woke up close to dinner time. I looked in the pantry and I had nothing to cook with! Grocery shopping was on my list of things to do! Thank goodness, I had some gluten free pasta, leftover roasted chicken, a few fresh tomatoes, a fairly fresh bunch of parsley and some wine! You could easily make this low carb with zucchini noodles or spaghetti squash, but sometimes I enjoy a small portion of gluten free pasta. This recipe will be perfect for leftover turkey too! I adore my cast iron pan and cook most of our meals in it. Clean up is simple and there's something about cast iron that just makes the food taste better! Do you have one? If not, then look at this one here. It's preseasoned and highly rated. Add pasta to a large pan of boiling salted water. While the pasta cooks prepare the sauce. Cook pasta just under al dente. It will finish in the sauce. In a large cast iron fry pan, add olive oil and heat to medium. Add onion and saute, stirring for a few minutes. Careful not to burn. Add chicken and garlic and cook gently for several minutes. You don't want to break up the chicken too much or burn the garlic either. Add butter and seasonings, stir in. Add white wine and scrape the bottom of the pan to get all of the brown bits up. I start with two cups, but often add more as it simmers. Add tomatoes and Parmesan, toss in. I add the tomatoes towards the end so they will barely cook. The Parmesan thickens the sauce. Add Penne and splash or two of the starchy pasta water to help thicken the sauce. Add the parsley and toss. Cook for a few minutes more until sauce thickens and pasta is done. 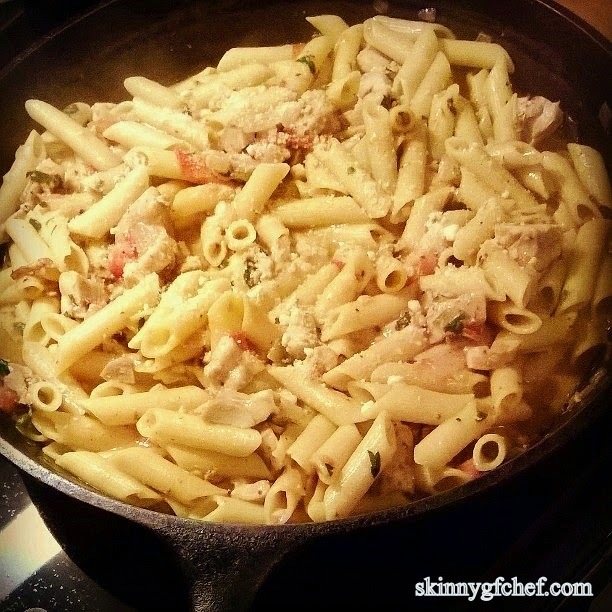 I make a chicken pasta similar to this, and it is so yummy. My girls gobble it right up! Thanks for sharing. Ali! This sounds absolutely divine! I am going to try this for sure! This looks so delicious! And perfect timing to try it with my leftover turkey! I'm so impressed with what you whipped up with "nothing" in your pantry :-) I tried to cook up some pasta for my kids last night before heading out, then forgot about it, and the entire pot turned black and the pasta was ruined. Big sigh... This looks delicious! This sounds like a good idea to make with that left over turkey we'll be having. This looks so yummy! I want it now!